This name uses Eastern Slavic naming customs; the patronymic is Yefimovich and the family name is Nemtsov. IRI Freedom Award (the US, posthumously). Nemtsov criticized Putin's government as an increasingly authoritarian, undemocratic regime, highlighting widespread embezzlement and profiteering ahead of the Sochi Olympics, and Russian political interference and military involvement in Ukraine. After 2008, Nemtsov published in-depth reports detailing the corruption under Putin, which he connected directly with the President. 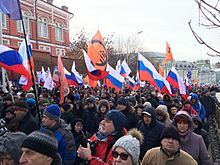 As part of the same political struggle, Nemtsov was an active organizer of and participant in Dissenters' Marches, Strategy-31 civil actions and rallies "For Fair Elections". Nemtsov was the first governor of the Nizhny Novgorod Oblast (1991–97). Later he worked in the government of Russia as Minister of Fuel and Energy (1997), Vice Premier of Russia and Security Council member from 1997 to 1998. In 1998, he founded the Young Russia movement. In 1998, he co-founded the coalition group Right Cause and in 1999, he co-formed Union of Right Forces, an electoral bloc and subsequently a political party. He was elected several times as a member of the Russian parliament. Nemtsov was also a member of the Congress of People's Deputies (1990), Federation Council (1993–97) and State Duma (1999–2003). He also served as Vice Speaker of the State Duma and the leader of parliamentary group Union of Right Forces. After a 2008 split in the Union of Right Forces, he co-founded Solidarnost. In 2010, he co-formed the coalition "For Russia without Lawlessness and Corruption", which was refused registration as a party. Beginning in 2012, Nemtsov was co-chair of the Republican Party of Russia – People's Freedom Party (RPR-PARNAS), a registered political party. 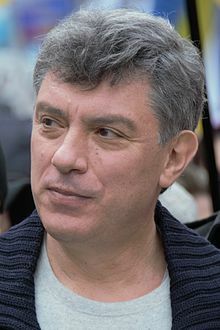 At the time of his death, Nemtsov was one of the leaders of the Solidarnost ("Solidarity") opposition movement, an elected member of the regional parliament of Yaroslavl Oblast, and co-chair of the RPR-PARNAS, which is a member of the Alliance of Liberals and Democrats, a Pan-European political party. Boris Yefimovich Nemtsov was born in Sochi in 1959 to Yefim Davidovich Nemtsov and Dina Yakovlevna Eidman. His mother, a physician, is Jewish. His parents divorced when he was five years old. In his autobiography, Nemtsov recounts that his Russian Orthodox paternal grandmother had him baptized as an infant, and that he became[when?] a practicing Orthodox Christian. He found out about his baptism many years later. From 1976 to 1981, Nemtsov studied physics at N. I. Lobachevsky State University in the city of Gorky, receiving a degree in 1981. Aged 25 in 1985, he defended his dissertation for a PhD in Physics and Mathematics from the State University of Gorky. Until 1990, he worked as a research fellow at the Radiophysical Research Institute, and produced more than 60 academic publications related to quantum physics, thermodynamics and acoustics. He proposed a theoretical model for an acoustic laser and a novel design of antennas for space probes. Anti-Nemtsov and anti- Chubais protest in 1998. The posters say "Send Chubais and Nemtsov to justice! ", "Make soap out of Zionists"
In the wake of the Chernobyl disaster in 1986, Nemtsov organized a protest movement in his hometown which effectively prevented construction of a new nuclear power plant in the region. In 1989, Nemtsov unsuccessfully ran for the Soviet Congress of People's Deputies on a reform platform which for the time was quite radical, promoting ideas such as multiparty democracy and private enterprise. In Russia's first free elections of 1990 he ran for the Supreme Soviet of the Russian Republic representing Gorky, later renamed Nizhny Novgorod. Nemtsov was elected, the only non-communist candidate. He defeated twelve others. Once in Parliament he joined the "Reform Coalition" and "Centre-Left" political groups. In the Russian parliament, Nemtsov was on the legislative committee, working on agricultural reform and the liberalization of foreign trade. In this position he met Boris Yeltsin, who was impressed with his work. During the October 1991 attack on the government by Yeltsin opponents, Nemtsov vehemently supported the president and stood by him during the entire clash. After those events, Yeltsin rewarded Nemtsov's loyalty with the position of presidential representative[clarification needed] in his home region of Nizhny Novgorod. In November 1991 Yeltsin appointed him Governor of the Nizhny Novgorod region. He was re-elected to that position by popular vote in December 1995. His tenure was marked by a wide-ranging, chaotic free market reform program nicknamed "Laboratory of Reform" for Nizhny Novgorod and resulted in significant economic growth for the region. Nemtsov's reforms won praise from former British Prime Minister Margaret Thatcher, who visited Nizhny Novgorod in 1993. From the very outset of Nemtsov's tenure as governor, according to Serge Schmemann, Nemtsov "embarked on a whirlwind campaign to transform the region, drawing enthusiastic support from a host of Western agencies." Although the province was closed to foreigners for years and "there wasn't even enough paper money for the privatization program", he was optimistic about Moscow's future and consequently "pushed ahead on his own, even issuing his own money—chits, to be eventually exchanged for rubles that came to be known as 'Nemtsovki.'" Nemstov very openly looked to the West as a model for Russia's future. Schmemann noted that Nemtsov adopted the westernized title "Governor" rather than the Russian "Head of Administration". After Nemtsov's death, Leonid Bershidsky recalled meeting him in 1992 during his tenure as governor. "A brilliant young physicist", recounted Bershidsky, "he was trying to practice liberal economics in a gloomy Soviet-era industrial city that had long been off-limits to foreigners." Bershidsky described his eloquence and demeanor as that of "a Hollywood movie politician transplanted into the Russian hinterland." In December 1993, Nemtsov was elected to the Federation Council, the upper house of the Russian Parliament. During the election campaign he was backed by Russia's Choice and Yabloko, which were then the principal liberal parties in the country. In 1996, Nemtsov brought Yeltsin a petition with one million signatures against the first war in Chechnya, which he had signed himself. In March 1997, Nemtsov was appointed First Deputy Prime Minister of the Russian Federation, with special responsibility for reform of the energy sector. He was tasked with restructuring the monopolies and reforming the housing and social sectors. He became widely popular with the public and appeared favoured to become President of Russia in 2000. Boris Yeltsin introduced him to Bill Clinton as his chosen successor. In the summer of 1997, opinion polls gave Nemtsov over 50% support as a potential presidential candidate. His political career, however, suffered a blow in August 1998 following the crash of the Russian stock-market and the ensuing economic crisis. Nemtsov had only worked in Moscow's "White House" for a year and a half, although he stated he had some success. He ended the corrupt act of stashing budget funds in commercial banks. He also managed to introduce an anti-corruption law for all state purchases in the government. He also helped to end the illegal export of raw materials and made oil sales more transparent. "And, most importantly, while I was the minister responsible for fuel and energy, oil was at barely 10 US dollars per barrel, and still we managed to save Russia. Things were difficult, what with social unrest, strikes, the war in Chechnya, the 'default', and still – let me repeat – we did save Russia." As part of Chubais' economic team, Nemtsov was forced to resign his position of Deputy Prime Minister. After the dismissal of Prime Minister Victor Chernomyrdin in 1998,[clarification needed] Nemtsov was reappointed Deputy Prime Minister, but resigned shortly afterwards when Yeltsin dissolved the government. According to The Economist, Nemtsov, unlike many other top government figures, "emerged from the troubled 1990s with his reputation intact." As early as 1998, Nemtsov had a personal web site on RuNet. Nemtsov.ru sought to provide information to its users that was not available elsewhere and also was one of the first attempts by a politician to establish two-way communication with an audience. In August 1999, Nemtsov became one of the co-founders of the Union of Right Forces, a then new liberal-democratic coalition which received nearly 6 million votes, or 8.6% of the vote, in the parliamentary elections in December 1999. Nemtsov himself was elected to the State Duma, or lower house of Parliament, and became its Deputy Speaker in February 2000. In May 2000, Sergei Kiriyenko resigned and Nemtsov was elected leader of the party and its parliamentary group.[who?] Over 70% of delegates at the Union of Rightist Forces congress in May 2001 confirmed him as party leader. According to Nemtsov, the Union "always consisted of two factions, a Nemtsov faction and a Chubais faction", with the former "based on principles and ideology whereas the Chubais faction was pragmatic, existing by the rules of realpolitik." In 2002, his name appeared on a list of several individuals the hostage-takers during the Moscow theater hostage crisis were willing to speak to directly. Nemtsov did not take part in the negotiations and later said that Putin had ordered him not to go. Between 2000 and 2003, Nemtsov was in a difficult political position – while he vehemently believed President Vladimir Putin's policies were rolling back democracy and civic freedoms in Russia, he needed to collaborate with the powerful co-chairman of the Union of Rightist Forces, Anatoly Chubais, who favoured a conciliatory line towards the Kremlin. In the parliamentary elections of December 2003, the Union of Rightist Forces platform headed by both Nemtsov and Chubais received just 2.4 million votes, 4% of the total, and thus fell short of the 5% threshold necessary to enter Parliament and as a result lost its seats. In January 2004, Nemtsov resigned from the party leadership. He became Chairman of the Council of Directors of Neftianoi, an oil company, and also a political advisor to Ukrainian president Viktor Yuschenko. In January 2004, Nemtsov co-authored with his longtime adviser and party colleague Vladimir V. Kara-Murza an article in Nezavisimaya Gazeta entitled "Appeal to the Putinist Majority", in which he warned of the danger of an impending Putin dictatorship. Later the same month he co-founded "Committee 2008", an umbrella group of the Russian opposition which also included Garry Kasparov, Vladimir Bukovsky and other prominent liberals. In February 2004, Nemtsov was appointed as a director of the Neftyanoi Bank, and as Chairman of Neftyanoi Concern, an oil firm and the bank's parent company. In December 2005, however, prosecutors announced an investigation of the bank following allegations of money laundering and fraud. Nemtsov subsequently stepped down from both his positions, saying that he wanted to minimize political fallout for the bank from his continuing involvement in Russian politics. Nemtsov also alleged that his bank perhaps was targeted because of his friendship and support of former Prime Minister Mikhail Kasyanov, who had stated his intention to run for president in 2008. During the 2004 Ukrainian presidential elections, Nemtsov came out as a strong supporter of the eventual winner Viktor Yushchenko, while the Russian government backed his opponent, Viktor Yanukovych. Shortly after the Orange Revolution, as the elections and series of protests in Ukraine came to be called, Yushchenko appointed Nemtsov as an economic adviser. Nemtsov's main goal was to improve business ties between Ukraine and Russia, damaged after the Putin government strongly supported Yushchenko's opponent in the presidential election. Yushchenko's selection of Nemtsov was controversial owing to Nemtsov's vocal criticism of Putin. The relationship between Nemtsov and the Ukrainian government became unstable in the middle of 2005 following accusations that Nemtsov had criticized Ukrainian cabinet decisions, and a group of legislators called for Yushchenko to fire Nemtsov. Despite the criticism, he remained as an economic adviser to Yushchenko until October 2006, when the office of the Ukrainian president announced that Nemtsov had been "relieved of his duties as a free lance presidential adviser". On 26 December 2007, Nemtsov withdrew his candidacy for the 2008 presidential election, saying that he did not want to draw votes away from the other candidate of the "democratic opposition", Mikhail Kasyanov. On 13 December 2008, Nemtsov and Garry Kasparov co-founded the political opposition movement Solidarnost (Solidarity). The organization hoped to unite the opposition forces in Russia. Nemtsov said in February 2011 that Solidarity had "done everything it could to resolve" conflicts within the opposition and that those "who are trying to create a rift among the opposition, whether consciously or unconsciously, are helping Putin stay in power." At a Solidarnost meeting on 12 March 2009 Nemtsov announced that he would run for mayor of Sochi in the city's 26 April election. As a Sochi native, he had criticized plans to hold the 2014 Winter Olympics in the town. He believed it was this criticism which led Nashi members to attack him with ammonium chloride on 23 March 2009. In a March 2010 interview, Nemtsov criticized the decision to hold a Winter Olympics in Sochi, saying that Putin had "found one of the only places in Russia where there is no snow in the winter. ... Sochi is subtropical. There is no tradition of skating or hockey there. In Sochi, we prefer football, and volleyball, and swimming. Other parts of Russia need ice palaces—we don't." The construction at the Olympics site was "disastrous" for the local economy, he added, saying that about 5,000 citizens had been removed from their homes to build Olympic facilities. He also added that "thanks to the corruption and incompetence of authorities, [these people have] not yet been adequately compensated for their property or been given equivalent housing elsewhere, as they were promised. Billions of dollars have simply disappeared." On 27 April 2009, it was announced that the acting Sochi mayor and United Russia candidate Anatoly Pakhomov had won the election with 77% of the vote. Nemtsov, who came second with around 14% of the vote, contested the fairness of the election, alleging that he was denied media access and that government workers had been pressured to vote for Pakhomov. Nemtsov was among the 34 original signatories of the online anti-Putin manifesto "Putin must go", published on 10 March 2010. Six months later, in September 2010, together with Vladimir Ryzhkov, Mikhail Kasyanov and Vladimir Milov, Nemtsov formed the "For Russia without Lawlessness and Corruption" party, which, three months later was transformed into the People's Freedom Party. In May 2011 the party submitted an application for registration to the Ministry of Justice, but one month later it was denied. In response to the question "Nemtsov, Milov and Ryzhkov and others, what do they really want?" in a live television broadcast on 16 December 2010, Putin stated that during the 1990s "they dragged a lot of billions along with Berezovsky and those who are now in prison... They have been pulled away from the manger, they had been spending heavily, and now they want to go back and fill their pockets". In January 2011, Nemtsov, Milov and Ryzhkov brought suit over Putin's statement before the Moscow City Court, but the following month the suit was dismissed. According to the judge, Tatiana Adamova, the names of Nemtsov, Milov and Ryzhkov were used merely as common names to refer to a certain class of politicians. In a May 2013 report, Nemtsov stated that up to $30 billion had been stolen from funds allocated for the Sochi Olympics. He accused the Putin administration of cronyism and embezzlement of funds on a level so grand it posed a threat to Russian national security. He suggested "establishing a civic committee in charge of the investigation of the crimes committed around the Olympic project." Nemtsov was arrested on 25 November 2007 during an unauthorized protest against President Putin near the State Hermitage Museum. Nemtsov and other opposition figures had complained of official harassment, and the police force had been used a number of times to break up what was then known as Dissenters' Marches. Nemtsov was released later that day. On 31 December 2010, he was arrested with other opposition leaders during a rally against government restrictions on public protests. He was sentenced on 2 January 2011 to 15 days in jail. The arrests were condemned by US Senators John McCain and Joe Lieberman, and by Amnesty International, which described him as a prisoner of conscience. The Economist called his arrest "a new low" in the governance of Russia. "The mistreatment of him seems pointlessly malevolent. ... He poses no threat to the government. The rally was authorized and he was on his way home when the police stopped him. He was charged with disobeying the police and swearing, despite video-footage that showed him asking the police to 'calm down'. A judge would not admit this as evidence. The court disregarded witness statements supporting him and would not let him appeal against his conviction." During the 6 December 2011 protests in Moscow, Nemtsov was arrested with at least one hundred other demonstrators. After his dismissal from the government, Nemtsov became an important actor in the political discourse and eventually in the opposition to Putin's government. Nemtsov's political beliefs have caused some to characterize him as a "new liberal". In February 2011, Nemtsov said: "Everyone is unhappy with Putin, save perhaps his closest friends." He noted that "for three consecutive years capital has been flowing out of the country, with some 40 billion dollars being taken out of the country in 2010 alone." As a result, "even within his party of corrupt thieves there are not so many people willing to follow him until the very end." [Putin had] used the Moscow theatre siege to impose a regime of total censorship on TV; he went on to destroy NTV, and then TV6. He used the nightmare of Beslan to remove democratic elections of regional governors. In short, he 'drowned' everyone apart from the terrorists." There is a myth spreading about how, in the 1990s, we democrats were pals with oligarchs while Putin was fighting them. It was exactly the other way around. We did not let Berezovsky get a foothold in [the world's largest natural gas company] Gazprom, we did not allow him to take over the Svyazinvest company [Russia's largest telecom holding]. Yet Putin used to go to his birthday parties and bring flowers to his wife. It was Berezovsky who lobbied for Putin to become president and then financed his campaign. Nemtsov told Newsweek in September 2011 that Putin's decision to run for president again "was predictable, but we were shocked by the hypocrisy and cynicism of the announcement: he declared he was coming back long before the elections. Putin and Medvedev did not even bother to share their decision to swap their chairs with the United Russia party before the congress. Russians had no choice but face his final decision; his usurpation of political power is sickly humiliating." Nemtsov said that all of his "friends in big business" planned "to take their capital out of Russia", while some "prefer to emigrate." In a March 2012 op-ed for The Wall Street Journal, Nemtsov and Garry Kasparov expressed support for "the repeal of the Jackson-Vanik amendment that impedes American trade relations with Russia". Nemtsov and Kasparov stated that at "opposition meetings following the fraudulent March 4 election", they and their associates "publicly resolved that Mr. Putin is not the legitimate leader of Russia." They explained that they wanted "the U.S. and other leading nations of the Free World [to] cease to provide democratic credentials to Mr. Putin", and asked that the U.S. replace Jackson-Vanik with the Sergei Magnitsky Rule of Law Accountability Act and thus improve relations between the United States and the people of Russia all while refusing aid to the Putin regime. We support Ukraine's course toward European integration [...] By supporting Ukraine, we also support ourselves. My condolences to the families of the victims. The bastards, who did this, must be destroyed. The separatists the other day bragged they had the Buk missiles, with which they wanted to take down an AN-26. If those are them, they must get no mercy. Nemtsov was among the few Russian statesman to vocally criticize the annexation of Crimea by Russia. Nemtsov stated that he viewed Crimea as an integral part of Ukraine, that he considered its annexation by the Russian Federation to be illegal, and that the people of Crimea and not Russian legislators should decide which country they want to live in. In an op-ed published on 1 September 2014 in the Kyiv Post, Nemtsov lamented the "fratricidal war" between Russia and Ukraine. This is not our war, this is not your war, this is not the war of 20-year-old paratroopers sent out there. This is Vladimir Putin's war. He accused Putin of "trying to dissect Ukraine and create in the east of the country a puppet state, Novorossiya, that is fully economically and politically controlled by the Kremlin." Meanwhile, wrote Nemtsov, "Russia itself is sinking into lies, violence, obscurantism and imperial hysteria." He stated that he sometimes thinks Putin is insane, but at other times he recognizes that Putin is driven by one goal: the "preservation of personal power and money at any cost." Ukraine had overthrown "a thieving president," and Putin needed to punish it "to make sure that no Russian would get these thoughts." Ukraine chose the European way, which implies the rule of law, democracy and change of power. Ukraine's success on this way is a direct threat to Putin's power because he chose the opposite course – a lifetime in power, filled with arbitrariness and corruption. I cannot understand what Putin expects when he arms 20,000 Kadyrovites. Putin diligently finances Chechnya by sending there trains loaded with money. The republic receives a minimum of 60 billion rubles a year in grants. Only Allah knows how much money is being siphoned off through different programs, such as Northern Caucasus Resorts. Less than three weeks before his murder, on 10 February, Nemtsov had written on Russia's "Sobesednik" news website that his 87-year-old mother was afraid Putin would kill him. He added that his mother is also afraid for former oligarch Mikhail Khodorkovsky and anti-corruption activist Alexei Navalny. When asked if he himself was afraid for his life, Nemtsov answered: "Yes, not as strongly as my mother, but still..." In an extended version of the interview, Nemtsov reportedly added: "I am just joking. If I were afraid of Putin, I wouldn't be in this line of work." And he was trying to convince himself, and me, they wouldn't touch him because he was a [former] member of the Russian government, a vice premier, and they wouldn't want to create a precedent. Because as he said, one time the power will change hands in Russia again, and those who served Putin wouldn't want to create this precedent. Just before midnight, at 23:31 local time on 27 February 2015, Nemtsov was shot several times from behind. He was crossing the Bolshoy Moskvoretsky Bridge in Moscow, close to the Kremlin walls and Red Square. [a] He died at the scene. He was murdered less than two days before he was due to take part in a peace rally against Russian involvement in the war in Ukraine and the financial crisis in Russia. The BBC reported: "In his last tweet, Mr. Nemtsov sent out an appeal for Russia's divided opposition to unite at an anti-war march he was planning for Sunday." The BBC also quoted him as saying: "If you support stopping Russia's war with Ukraine, if you support stopping Putin's aggression, come to the Spring March in Maryino on 1 March." The night after Nemtsov's murder, his papers, writings and computer hard drives were confiscated in a police search of his apartment on Malaya Ordynka street. Russian journalist Kseniya Sobchak said that Nemtsov had been preparing a report proving the presence of Russian military in eastern Ukraine despite its heated denial of any involvement there. Two weeks before his murder, Nemtsov had "met with an old friend to discuss his latest research into what he said was dissembling and misdeeds in the Kremlin." Yevgenia Albats, editor of The New Times magazine, said that Nemtsov worked on a report which he planned to call "Putin and the War", because it focused on Russia's role in the Ukraine conflict. Albats commented on her fear for Nemtsov's life. According to The New York Times, some sources had accused the security services of responsibility for the crime, while others blamed rogue Russian nationalists. Vladimir Milov, a former deputy minister of energy and fellow opposition figure, said: "There is ever less doubt that the state is behind the murder of Boris Nemtsov" and stated that the objective had been "to sow fear." Opposition activist Maksim Kats held Putin responsible: "If he ordered it, then he's guilty as the orderer. And even if he didn't, then [he is responsible] as the inciter of hatred, hysteria, and anger among the people." Shortly after Nemtsov's murder, Julia Ioffe a reporter, wrote that several theories about the crime had begun to circulate. "Yet we can be sure that the investigation will lead precisely nowhere", she stated. "At most, some sad sap, the supposed trigger-puller, will be hauled in front of a judge, the scapegoat for someone far more powerful. More likely, the case will founder for years amid promises that everyone is working hard, and no one will be brought to justice at all." Ioffe said that the Kremlin was already "muddying the waters". LifeNews, a publication tied to Russia's security agencies, had suggested "three possible theories", namely that the killing was "revenge for forcing Duritskaya to get an abortion", or that it "had something to do with money Nemtsov was receiving from allies abroad", or that it was "an attempt to smear the Kremlin." A statement by the government's Investigative Committee theorized that Nemtsov was "killed by someone from his own opposition movement who wanted to create a martyr" and even suggested "that the assassination was connected to the Charlie Hebdo killings." Several suspects have been implicated in the assassination, all of whom are Chechens. The alleged shooter is a former officer in the security force of Chechen leader Ramzan Kadyrov, who was also accused by opposition leader Ilya Yashin of having murdered Nemtsov. Five Chechen men in total are being prosecuted for his murder. Former Russian Prime Minister Mikhail Kasyanov lamented Nemtsov's death, expressing his shock that such an event could occur in modern Russia. 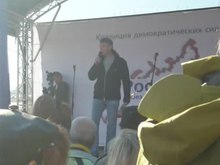 At a memorial rally held in Moscow on 1 March, the date on which Nemtsov had planned to lead an opposition march, mourners carried signs that read: "He was fighting for a free Russia," "Those shots were in each of us," "He died for the future of Russia," and "They were afraid of you, Boris." Several thousand people also marched in St. Petersburg. Political consultant Gleb Pavlovsky opined that Russia had been overcome by "a Weimar atmosphere" in which there were "no longer any limits." Opposition activist Leonid Volkov maintained that Russians now lived "in a different political reality." United States President Barack Obama called on Russia's government to launch "a prompt, impartial, and transparent" investigation to ensure that "those responsible for this vicious killing are brought to justice". German Chancellor Angela Merkel condemned the "cowardly murder". A statement by her office demanded that Putin "assure himself that this assassination is elucidated and that its perpetrators are held accountable". An editorial in The Observer called Nemtsov's murder "appalling" and reflected that such an event was characteristic of an authoritarian dictatorship. Serge Schmemann of The New York Times wrote that the Moscow rally seemed like "a memorial march for the hopes and dreams that lay alongside Mr. Nemtsov's murdered body in the middle of the night on the bridge to Red Square." Dmitry Peskov, a spokesman for Russian President Vladimir Putin, told reporters: "Putin noted that this cruel murder has all the hallmarks of a contract hit and is extremely provocative". In a message to the victim's mother, Putin said that "everything will be done so that the organisers and perpetrators of a vile and cynical murder get the punishment they deserve." Prime Minister Dmitry Medvedev said: "Boris Nemtsov became one of the most talented politicians in the period of democratic transformations in our country. Up to his very last day, he remained a bright personality, a principled man." In August 2015, Nemtsov's daughter Zhanna Nemtsova was the recipient of Poland's Democracy Award for her father's work. On 9 October 2015, opposition activists in Moscow erected a monument dedicated to Nemtsov at his tomb at Troyekurovskoye Cemetery, plot 16. The monument, unveiled on what would have been his 56th birthday, shows Nemtsov's name with five bullet holes puncturing it. In late February 2017, a peaceful protest and commemorative plaque dedication are planned in Veliky Novgorod, in commemoration of his ideology and the freedom of speech that led to his assassination. On December 6, 2017, the Council of the District of Columbia held a hearing to decide on symbolically renaming a section of Wisconsin Avenue as Boris Nemtsov Plaza. The Embassy of the Russian Federation fronts the section of street proposed for the designation. On January 9, 2018, the Council unanimously approved the "Boris Nemtsov Plaza Designation Act of 2017" which authorized the renaming. Medal of the Order "For Merit to the Fatherland", Second class, (10 March 1995) – for service to the state associated with the completion of the first phase of the voucher privatization scheme. Medal "For Strengthening of Brotherhood in Arms" (Ministry of Defense) (2001). Order of Holy Prince Daniel of Moscow (ROC) (1996) – for his contribution to nation-building. Honorary sign of the Legislative Assembly of Nizhny Novgorod Region "Merit" (26 March 2009). Order of Prince Yaroslav the Wise, Fifth class, (Ukraine) (19 August 2006) – for a significant contribution to the development of international cooperation, strengthening the authority and positive image of Ukraine in the world, popularization of its historical and modern achievements. Order of Liberty (Ukraine, posthumously). Jan Karski Eagle Prize (Poland, 15 May 2015, posthumously). Putin. Results. 10 years – June 2010, Putin: What 10 Years of Putin Have Brought, revised edition of the report Putin. Results of 2008. Putin. Corruption – March 2011. Written by co-chairmen of the People's Freedom Party Nemtsov, Milov, Ryzhkov and Solidarity movement spokesman Olga Shorina. The printing of the report was funded with donations. Entitled "Putin the Thief", this report stated that Putin's decade in power had seen "an extraordinary increase in the abuse of power and corruption." The report described Putin's corruption in detail and said that it far exceeded "the scale of corruption under Yeltsin." The report stated that corruption in Russia "has ceased being a problem in Russia; it has become a system" that "represents 25% of the country's GNP." In a May 2013 report, Nemtsov stated that up to $30 billion had been stolen from funds allocated for the Sochi Olympics. He accused the Putin administration of cronyism and embezzlement of funds on a level so grand it posed as a threat to Russian national security. He suggested "establishing a civic committee in charge of the investigation of the crimes committed around the Olympic project." At the time of his murder, Nemtsov was preparing for publication his next report proving the presence of Russian military in eastern Ukraine (BBC News International, 28 February 2015; a Russian source is quoting journalist Kseniya Sobchak on the matter). In May 2015 the report has been published under the title "Putin. War". The publication reported that more than 200 Russian soldiers were then operating in Ukraine. Nemtsov, Boris. 2000. "Reform for Russia: Forging a New Domestic Policy", Harvard International Review 22 (No. 2): 16–21. 2015 – My Friend Boris Nemtsov (Russian: Мой друг Борис Немцов, Moj drug Boris Nemtsov), documentary film by Zosia Rodkevich on the man and political actiivist Nemtsov. 2016 – Nemtsov (Russian: Немцов, Nemtsov), documentary film by Vladimir V. Kara-Murza. 2016 – The Man Who Was Too Free (Russian: Слишком свободный человек, Slishkom svobodnyy chelovek), documentary film by Mikhail Fishman and Vera Krichevskaya. This page is based on the Wikipedia article Boris Nemtsov; it is used under the Creative Commons Attribution-ShareAlike 3.0 Unported License (CC-BY-SA). You may redistribute it, verbatim or modified, providing that you comply with the terms of the CC-BY-SA.